This issue of DMHL presents two premier articles on gun violence: a.The Gun Violence Restraining Order: An Opportunity for Common Ground in the Gun Violence Debate and b. Doctors, Patients, and Guns: The First Amendment Rights of Doctors to Counsel Patients about Gun Safety and the Statutory Privacy Rights of Firearm Owners. Case Law Developments in federal and states courts are highlighted. 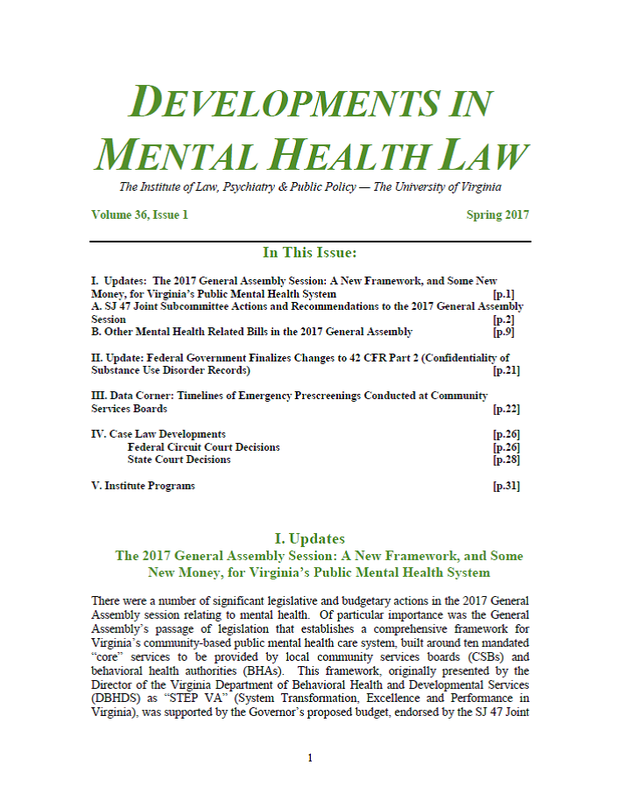 This issue of DMHL presents (a) Updates: The 2017 General Assembly Session: A New Framework, and Some New Money, for Virginia’s Public Mental Health System (b) a Data Corner: Timelines of Emergency Prescreenings Conducted at Community Services Boards (c ) outlines of significant recent cases in various federal and state courts. Please share this link to DMHL with your colleagues who may be interested.